This morning (my time) there was a moderately deep earthquake along the coast of southern Mexico and northern Guatemala. Here is my Temblor article about this M=6.6 earthquake and how it might relate to the 2017 M=8.2 quake. Offshore of Guatemala and Mexico, the Middle America trench is formed by the subduction of the oceanic Cocos plate beneath the North America and Caribbean plates. 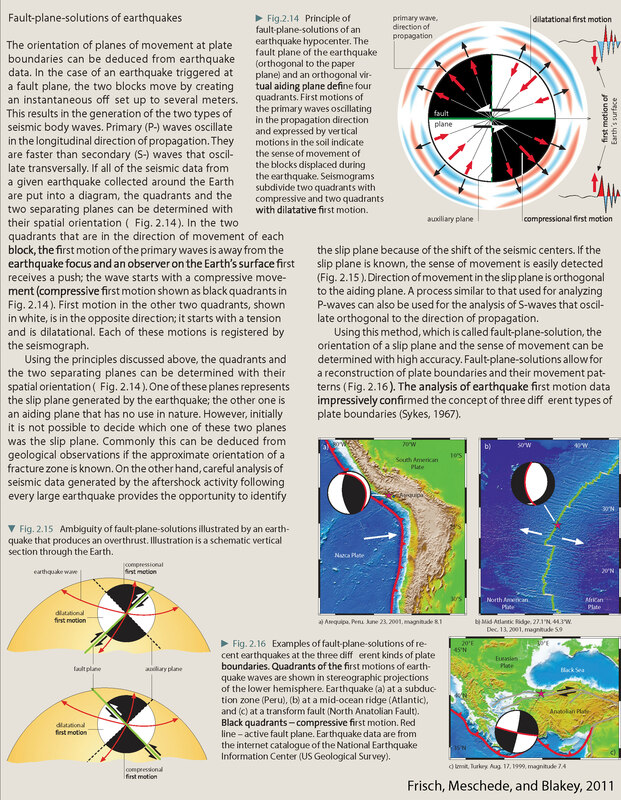 To the east of Guatemala and Mexico, the North America and Caribbean plates are separated by a left lateral (sinistral) strike-slip plate boundary fault (that forms the Cayman Trough beneath the Caribbean Sea). As this plate boundary comes onshore, this fault forms multiple splays, including the Polochi-Montagua fault. 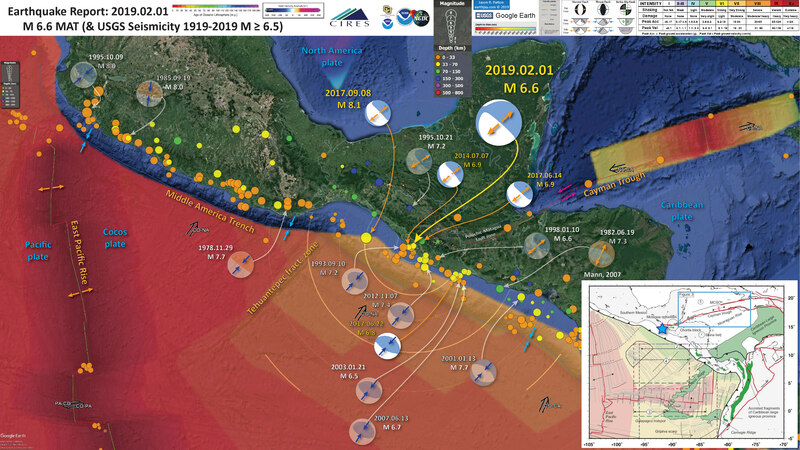 As this system trends westwards across Central America, it joins another strike-slip plate boundary associated with the subduction zone (the Volcanic Arc fault). South of about 15°N, the relative plate motion between the Caribbean and Cocos plates is oblique (they are not moving towards each other in a direction perpendicular to the subduction zone fault). At plate boundaries where plate convergence is oblique (like also found in Sumatra), the strain is partitioned onto the subduction zone (for fault normal component of the relative plate motion) and a forearc sliver fault (for the fault parallel relative motion). The Tehuantepec fracture zone (TFZ) is a major structure in the Cocos plate. Coincidentally, the strike-slip fault systems trend towards where the TFZ intersects the trench. There is left-lateral offset of the seafloor across the TFZ so the crust is about 10 million years older on the north side of the eastern TFZ. This age offset changes the depth of the crust across the TFZ and also may affect the megathrust fault properties on either side of the TFZ. In addition, the TFZ may have geological properties that also affect the fault properties when this part of the plate subducts (affecting where, when, and how the fault slips). There are so many things going on, but I will mention one more thing. Something that also appears to be happening in this part of the subduction zone is that there may be gaps in the slab beneath the megathrust. If this is true (Mann, 2007), then there may be changes in slab pull tension along strike as a result of different widths of attached downgoing slab. In one map below, I include a transparent overlay of the age of the oceanic crust data from Agegrid V 3 (Müller et al., 2008). In the lower left corner is a pair of figures from Manea et al. (2013). On the left is a map showing some major plate boundary faults and other fault systems relevant to this region. On the right is a low angle oblique visualization of the Cocos plate. North is to the lower right. The depth of the slab is shown in shades of blue (see legend). Note the offset of blue color across the TFZ. In the upper right corner is another low angle oblique visualization of the structures (Manea et al., 2013). Note the difference in depth of the slab across the TFZ and how the forearc sliver and North America / Caribbean strike-slip faults cross the upper plate. 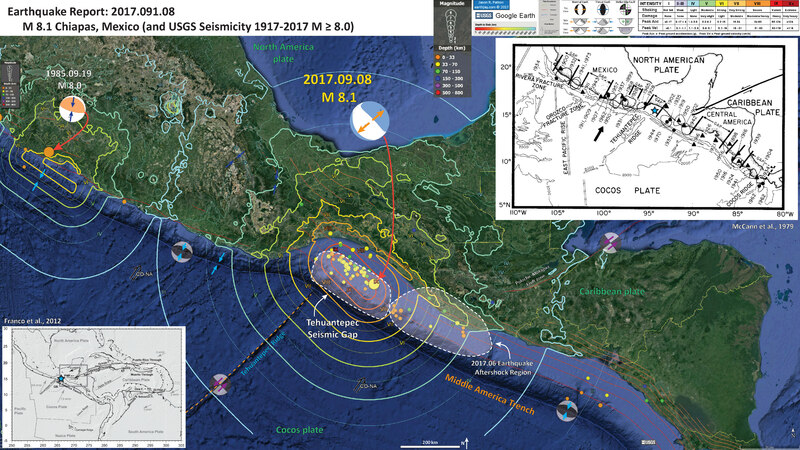 Read more about the forearc sliver in this report about an earthquake in El Salvador. In the lower right corner is a map of the region showing details of the structures in the Cocos plate (Mann, 2007). There are an abundance of faults associated with the spreading ridges and offsets of these by numerous fracture zones. Note how the Cocos plate is formed by 2 different spreading ridges. Here is the map with a century’s seismicity plotted, using the age of the crust as an overlay. There are also some interesting relations between different historic earthquakes. In 2017 there was a series of large magnitude earthquakes in the region of today’s M=6.6 and further to the south. 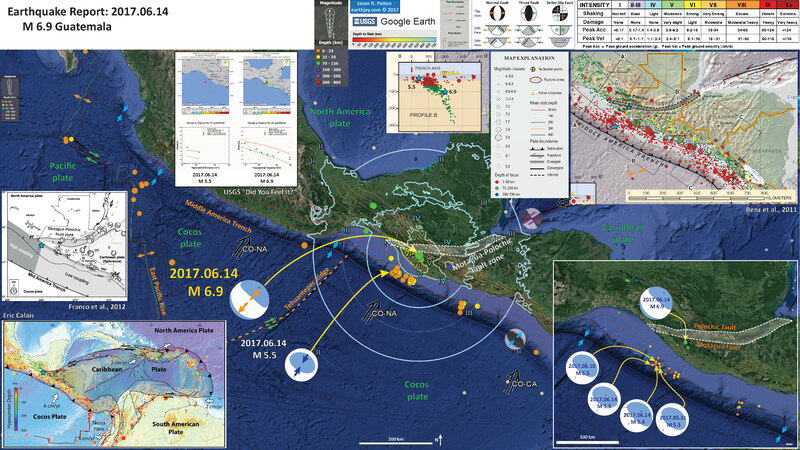 These quakes are highlighted in the posters above, notable are the 6 Jun M=6.9 and 22 Jun M=6.8. The first quake was a deep extensional event, followed by a thrust event (possibly triggered by the M=6.9). In addition, there was a M=6.9 extensional earthquake in 2014 that also may have been a player. I presented an interpretive poster showing the zone of aftershocks associated with the June sequence. Later, in Sept, there was a M=8.2 extensional tsunamigenic earthquake to the north of the June sequence. If we look at the aftershock zone for the M=8.2 quake, it looks like a sausage link adjacent to the sausage link formed by the June aftershocks. mmmm veggie sausages. However there was no megathrust earthquake in the area of the M=8.2 sequence. Here is an interpretive poster showing how the 2017 June and September sequences spatially relate. Here is a report where I discuss the June 2017 sequence in greater detail. Here are some figures from Manea et al. (2013). First are the map and low angle oblique view of the Cocos plate. A. Geodynamic and tectonic setting alongMiddle America Subduction Zone. JB: Jalisco Block; Ch. 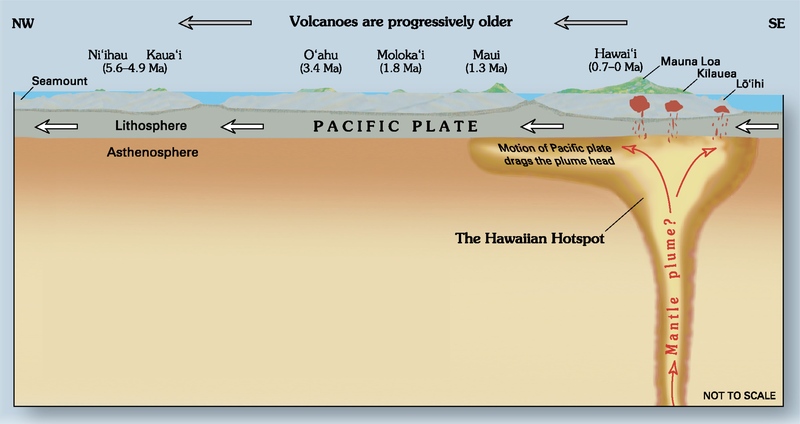 Rift—Chapala rift; Co. rift—Colima rift; EGG—El Gordo Graben; EPR: East Pacific Rise; MCVA: Modern Chiapanecan Volcanic Arc; PMFS: Polochic–Motagua Fault System; CR—Cocos Ridge. Themain Quaternary volcanic centers of the TransMexican Volcanic Belt (TMVB) and the Central American Volcanic Arc (CAVA) are shown as blue and red dots, respectively. B. 3-D view of the Pacific, Rivera and Cocos plates’ bathymetrywith geometry of the subducted slab and contours of the depth to theWadati–Benioff zone (every 20 km). Grey arrows are vectors of the present plate convergence along theMAT. The red layer beneath the subducting plate represents the sub-slab asthenosphere. Here is the figure that shows how the upper and lower plate structures interplay. Kinematic model (mantle reference frame) of the subducting Cocos slab along the MAT in the vicinity of Cocos–Caribbe–North America triple junction since Early Miocene. 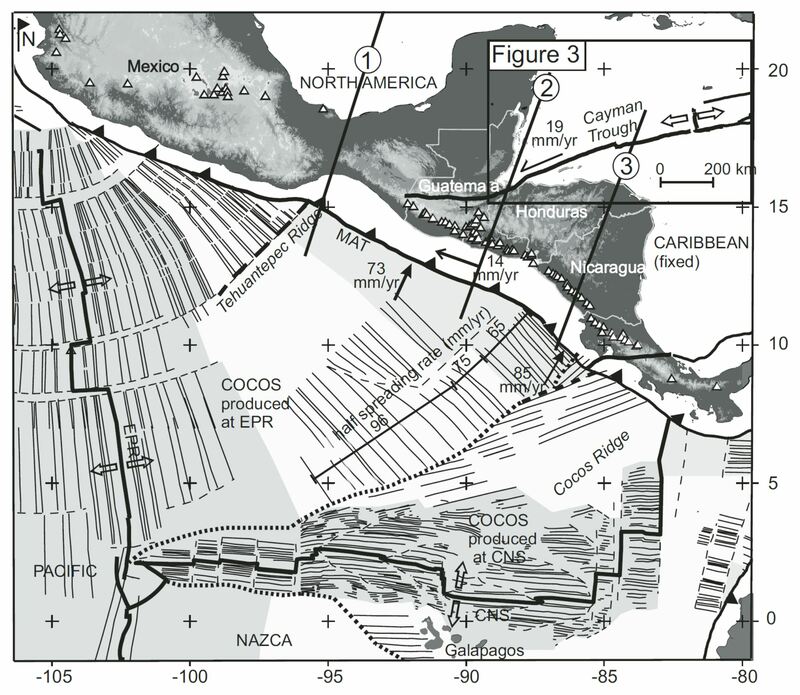 The evolution of Caribbean–North America tectonic contact is based on the model of Witt et al. (2012). The blue strips represent markers on the Cocos plate. Note how trench roll forward is associated with steep slab in Central America, whereas trench roll back is associated with flat slab in Mexico. Here are 2 different figures from Mann (2007). First we see a map that shows the structures in the Cocos plate. Note the 3 profile locations labeled 1, 2, and 3. These coincide with the profiles in the lower panel. 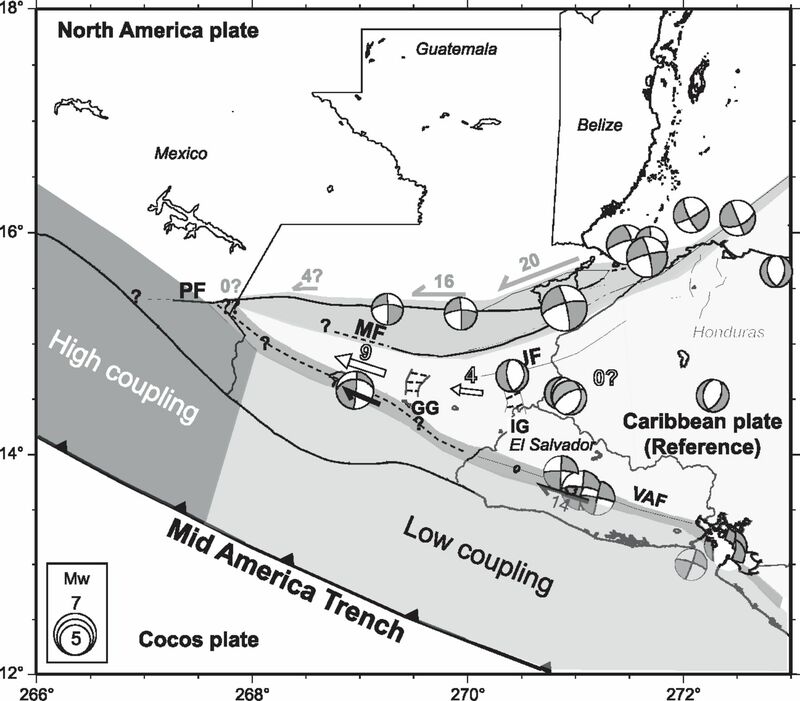 Present setting of Central America showing plates, Cocos crust produced at East Pacifi c Rise (EPR), and Cocos-Nazca spreading center (CNS), triple-junction trace (heavy dotted line), volcanoes (open triangles), Middle America Trench (MAT), and rates of relative plate motion (DeMets et al., 2000; DeMets, 2001). East Pacifi c Rise half spreading rates from Wilson (1996) and Barckhausen et al. (2001). Lines 1, 2, and 3 are locations of topographic and tomographic profi les in Figure 6. Here are 2 different views of the slabs in the region. These were modeled using seismic tomography (like a CT scan, but using seismic waves instead of X-Rays). The upper maps show the slabs in map-view at 3 different depths. The lower panels are cross sections 1, 2, and 3. Today’s M=6.6 earthquake happened between sections 1 & 2. 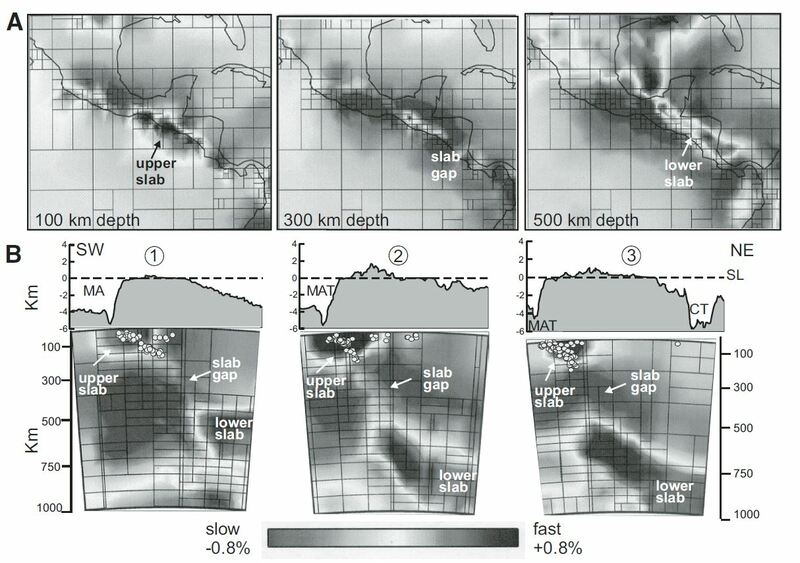 (A) Tomographic slices of the P-wave velocity of the mantle at depths of 100, 300, and 500 km beneath Central America. (B) Upper panels show cross sections of topography and bathymetry. Lower panels: tomographic profi les showing Cocos slab detached below northern Central America, upper Cocos slab continuous with subducted plate at Middle America Trench (MAT), and slab gap between 200 and 500 km. Shading indicates anomalies in seismic wave speed as a ±0.8% deviation from average mantle velocities. Darker shading indicates colder, subducted slab material of Cocos plate. Circles are earthquake hypocenters. Grid sizes on profi les correspond to quantity of ray-path data within that cell of model; smaller boxes indicate regions of increased data density. CT—Cayman trough; SL—sea level (modifi ed from Rogers et al., 2002). These figures are from the USGS publication (Benz et al., 2011) that presents an educational poster about the historic seismicity and seismic hazard along the Middle America Trench. First is a map showing earthquake depth as color (green depth > red). Seismicity cross section B-B’ is shown on the map. Today’s M=6.6 quake is nearest this section. Franco et al. (2012) used GPS observations to evaluate the kinematics (how the plates move and interact relative to each other) of this region. Below is a map that shows earthquake mechanisms that reveal the strike-slip faults as they converge. The forearc sliver (the block between the megathrust and the forearc sliver fault) is shaded gray. These authors also use a model to estimate how much the megathrust is locked and accumulating elastic strain. They evaluate a range of possible physical properties of the find that the megathrust north of the forearc sliver is more highly locked (seismogenically coupled). Proposed model of faults kinematics and coupling along the Cocos slab interface, revised from Lyon-Caen et al. (2006). Numbers are velocities relative to CA plate in mmyr−1. Focal mechanisms are for crustal earthquakes (depth ≤30 km) since 1976, from CMT Harvard catalogue. Here is a map from Benz et al. (2011) that shows the seismic hazard for this region. Below is a video that explains seismic tomography from IRIS. 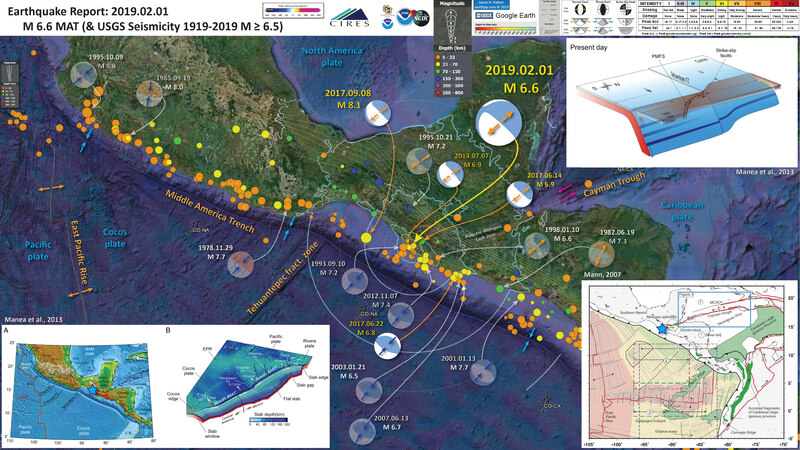 Benz, H.M., Dart, R.L., Villaseñor, Antonio, Hayes, G.P., Tarr, A.C., Furlong, K.P., and Rhea, Susan, 2011 a. Seismicity of the Earth 1900–2010 Mexico and vicinity: U.S. Geological Survey Open-File Report 2010–1083-F, scale 1:8,000,000.
in northern Central America: Geological Society of America Special Paper 428, p. 1–19, https://doi.org/10.1130/2007.2428(01).